Many temples built in Madhya Pradesh are famous for their structural beauty and legends connected with them. Few amongst the famous temples are Chamunda Matha and Tulja Bhavani Devi cave temples, both found on top of a small hill called Tekri (In Hindi Tekri means Hill) in the district of Dewas that lies in between Indore, Bhopal and Ujjain. Dewas an ancient and beautiful town situated in Malwa region in the West-central part of Indian state of Madhya Pradesh is 143 km south west from state capital Bhopal, and 35 km from Indore the commercial capital of Madhya Pradesh. The name Dewas is derived from the belief that the Devi resides on the hill which is called Devi’s vasasthal (Residence in Sanskrit). Over period of time the name Devi Vashasthal has condensed to become Devivasini and then to Dewas. The hillock temples – ‘Tekri Devi’ as called lies roughly 350 feet above sea level and visited by thousands of devotees throughout the year. Especially during the nine days of Navarathri festival, laks of devotees from nearby towns and villages walk bare footed to reach Tekri matha temples to offer worship to the Devi. It would not be exaggerated view if one claim that even children in the age of five to six years walk bare footed unmindful of the heat of sun, along with elders in age group of sixty to seventy years, which will reveal the extent of faith the devotees have in their heart for the Devi, specially Chamunda Matha the younger sister amongst the two and who is considered to be an aspect of Mahishasura Martini. Of the two Devi temples on the hill, one is of Chamunda Mata and the other for Tulja Bhavani Mata, the eldest amongst them. While Chamunda Devi is Kuldevi of the erstwhile Maratha rulers of Dewas, Tulja Bhavani was the tutelary deity of Maratha Warrior Chathrapathi Shivaji Maharaja, the famous Maratha ruler who is highly revered by the Marathi speaking people throughout state of Maharashtra. Both the statues of the Devi’s have been carved out of huge rocks that form part of the hill. Some historians suggest that the hill shrine may have been constructed during the Kingdom of Parmar and may have been damaged in feudal wars, to be resurrected again during the reign of Maratha Kings of Dewas. The archeologists opine that the temples belonged to 9th or 10th BC while the priests in the temple float a theory that the statues belonged to 12th Century. However no culverts or documents are are available to authenticate the true version, but it has been seen that elaborate worship in the temples were in vague during the Maratha rulers of Dewas. Though some believe that the statues have manifested of their own, the actual period in which the statues have been carved out is also not known. The statues of both the Davis in separate shrines may have been carved out of the rock in the imagination of some sculpture, perhaps as visualized or as seen in their dreams in the Village deities’ style of south. Chamunda Matha as reverently worshiped is considered to be an aspect of Mahishasura Martini, who again is an aspect of Goddess Parvathi and the temple is considered to be one of the Sakthi Peetas as per the legend floated by word of mouth story for centuries. A small story is found in the Puranas regarding the emergence of Sakthi Pitas in several parts of the Universe. Once Daksha performed an Yagna to take revenge on Lord Shiva and invited all the Deities, semi Gods, Goddesses and saints and sages to attend the, but deliberately left out his son-in-law Lord Shiva and his own daughter Parvathi. Though uninvited, when Parvathi expressed her desire to attend the Yagna performed by her father Lord Shiva tried to dissuade her from attending the same. However due to persistence of Parvathi, Lord Shiva had to eventually relent and go with her to the Yagna site. Adding salt to the injury, they were not welcomed by Daksha and Daksha chose to further insult Lord Shiva in so many words. Parvathi was unable to bear her father’s insults toward her husband, so she immolated herself by falling into the Yagna fire. Angered by the insult meted out to him and the subsequent death of his wife Parvathi who jumped into the sacred fire unable to gulp the insult, Lord Shiva carried Parvathi’s corpse on his shoulders and ran around the world for days in rage. In order to calm down Lord Shiva, Lord Vishnu threw his Chakrayuda to cut Parvathi’s body into fifty one pieces, which fell at several places in the universe all of which subsequently became Sakthi Pitas. People believe that one amongst the fifty one Sakthi Peeta is Chamunda Matha Temple in Dewas. Here in the hillock temple Chamunda Matha is depicted with four hands three of which carry three different weapons that include Trisul and the fourth hand holding a human head. A small Swan is seen seated on her right hand side. 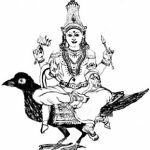 The swan found sitting under Devi Chamunda is baffling because Mahishasura Martini’s carrier is lion and that of Parvathi Nandi. The Swan is generally considered to be carrier vehicle for Goddess Saraswathi. Moreover the image of Chamunda Matha as seen in this temple is not found in any of the Hindu Scriptures or Puranas or even in any other temple sculptures. It is unique by itself. There are several legends connected with Ma Chamunda Devi. One legend says Goddess Chamunda fought as Chief Chamunda along with Rudra in the battle fought between demon Jalandhra and Lord Shiva. In reverence and memory of the victory in the battle a temple dedicated to Chamunda was established in Himachal Pradesh in which Chamunda Devi is worshiped as Rudra Chamunda’. As per another legend in a battle fought between the gods and demons, Chamunda devi emerged from an eyebrow of Goddess Kaushika who is an aspect of Goddess Parvathi and the one who came out her eyebrow was named Chandi (Some say Chandika Devi) devi and was assigned the task of eliminating demons Chanda and Munda who were possessed with several boons from Lord Brahma and vanquishing them by the then existing Gods or Goddesses were not possible. Therefore Chandi had to emerge in a different form to fight fierce battle with those two demons and at last killed them. Goddess Chandika took the slain heads of the two demons Chanda and Munda to display them to the Goddess Kaushika who created her. Immensely pleased, Goddess Kaushika blessed Chandi and bestowed upon her the title of Chamunda. Another legend says that in the famous battle as found in Devi Mahatmiyam Goddess Kali killed the two generals of Shumbha and Nishumba, two most dreadful Demons possessing several boons from Lord Shiva with which they terrorized those in heaven. The names of those two generals killed by her were Chanda and Munda and as a result of the victory Goddess Kali received the title Chamunda. 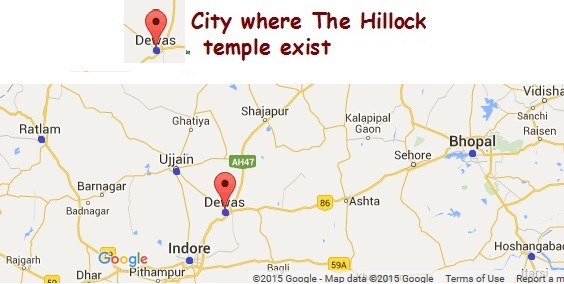 There is a story on how the Chamunda Devi temple came up on hillock in Dewas. Vikramaditya was a famous King who ruled Ujjain. 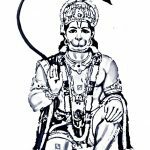 His brother Bharthahari turned into a saint went to Dewas and sat in a secluded place over the hill and sat on meditation. 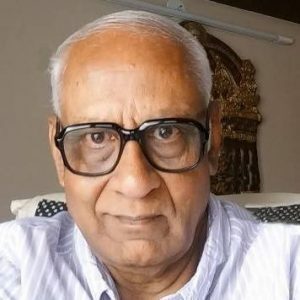 He belonged to Nath community. Since he was highly learned scholar every one affectionately called him Nathji (Ji is normally affixed for elderly and respected persons) and visited him to pay their respect and obeisance. 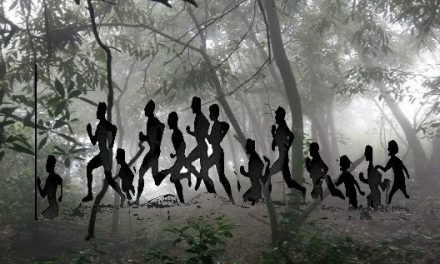 An Asura named Natagasura was also staying in the same hill and out of jealousy he started terrorizing those who came to pay obedience to Nathji. Therefore those who went to meet Bharthahari were afraid to climb the hill. Bharthahari knew that the hill was Sakthi Peeta. Therefore he prayed to Goddess Parvathi to put an end to the menace of Natagasura and to ensure that his devotees visited him without fear. 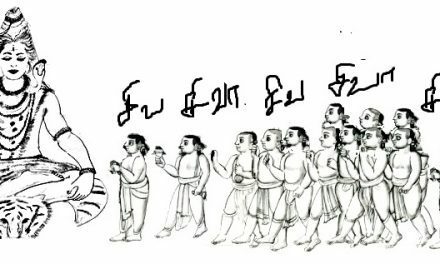 Parvathi pleased with his prayers appeared before him and promised to end the atrocities of the Asura at the request of Bharthahari. 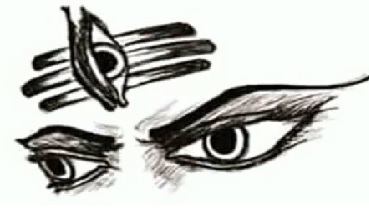 Thereafter Parvathi took the form of Chamunda Matha, chased Natagasura round the hill and finally killed him. Therefore people believe that Chamunda resided in that hill. Perhaps this could be the reason why the priest of the temple traditionally belonged to the Nath community. According to the Nath history, we find Bharthahari, brother of King Vikramaditya belong to Nath community. Yogi Gorakhnath, one other saint also belonged to this region. According to evidences of 250-300 years, it has been proved that this is a region of meditation for the Nath yogis. In respect of Thulja Bhavani, some information is available. Bhavani means one who gives mental strength and is kind hearted (In Sanskrit it is Karuna). Therefore in the twelfth century she was adored as Karuneswararoopi and worshiped by Chathrapathi Shivaji. In the year 1864 Narayana Pawar, one of the decedents of Chathrapathi Shivaji, who was the ruler of Dhar, also part of Malwa region which included Dewas in the then Central India reportedly compiled a verse in praise of Tulja Bhavani equating her with Maha Kali, Maha Lakshmi, Maha Saraswathi and Triloka Sundari. Therefore it is believed that the Dhar ruler might have constructed the temple for Tulja Bhavani in the hill. As per another story the twin sisters Chamunda Devi and Tulja Bhavani initially lived together in the Southern part of the hill in a cave. Over the years on account of a trivial issue ‘Who out of the two be worshiped first by the visiting devotees’, the sisters decided to part company and to live separately in different places. As Chamunda Devi, the younger one amongst them began walking out from Tulja Bhavani’s cave which was in the Southern side of the hill, Lord Hanuman came there rushing to prevent her from leaving the hill and instead pleaded with her to continue to stay in the same hill to bless her devotees who climbed the hill to visit them. Therefore Chamunda Devi made a tunnel from the cave of Tulja Bhavani and crossed over to the Northern side to settle in a cave there. The tunnel got closed by itself. The elder sister Tulja Bhavani however continued to remain in the same cave on the Southern side. One can see the big crack which was indeed the tunnel created by Chamunda behind Tulja Bhavani’s cave. The division in the sisters echoed in the family of Dewas Rulers too. The eldest of the two brothers, Thukoji Pawar and his subjects started worshiping Chamunda Matha while the Younger brother Jevaji Rao and his subjects continued to worship Tulja Bhavani. Though both the rulers established two separate paths to go to the hill top by laying separate roads and drinking water facilities inside Dewas, they did not demarcate the town with separating wall to show the division, people who went to the hill top worshiped both the Devi and jointly chanted ‘Jai Matha Ki Jai’ to show their solidarity to the sister Devi. Picking up the scattered small stones from the hill top, people make a small house like thing in blind belief that they would sooner or later build a house of their own. 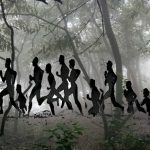 During nine days of Navarathri festival people from faraway places throng the temple by trekking barefooted till they reach the temple. Apart from the two Devi shrines, separate shrines in much smaller size (Caves) are also found for Lord Hanuman, Lord Bhairava, Annapurna, and Kali Devi. On top of the hill is a Durgah of a Muslim Peer which is visited by the Muslim community regularly. The Jain community has also constructed a beautiful monument made of marble in the same hill.